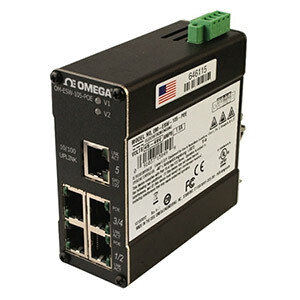 The OM-ESW-105-POE unmanaged industrial Ethernet Switch is designed to transmit power, along with data, over an Ethernet network and is ideal for PoE capable devices where running an AC power feed is either not possible or cost effective. This feature allows an end user to power a PoE camera, wireless access point, or any other PoE capable device without the need for running separate wires for power. This also allows the ability for a centralized battery backup for all these devices. Designed to meet the most demanding industrial communications requirements by providing high throughput and minimum downtime while also providing power to PoE capable devices over the Ethernet network. The OM-ESW-105-POE provides five RJ-45 auto sensing 10/100 BaseTX ports. All ports are full/ half duplex capable, using “state of the art” Ethernet switching technology. Four of the five RJ-45 ports also act as PoE ports allowing power to pass through four of the eight strands of CAT5 cable. Each PoE port supports up to 15.4 watts of power. The OM-ESW-105-POE auto-negotiates the speed and flow control capabilities of the five TX port connections, and configures itself automatically. The OM-ESW-105-POE also supports up to 2000 MAC addresses, enabling these products to support extremely sophisticated and complex network architectures. The OM-ESW-105-POE automatically detects any PoE device that is connected and powers it accordingly. If a PoE fault is detected on a specific port the Auto-disconnect feature disables PoE power on that port, allowing only data communications to pass. This reduces reducing the risk of damaging costly equipment. This ideal candidate provides data and power to wireless LAN access points, network cameras, VoIP, and other PoE capable devices. The product also helps reduce costs by eliminating the need for electrical wiring and electrician expenses. The OM-ESW-105-POE has extended operating environmental specifications to meet the harsh needs of the industrial environment. For cost savings and convenience it can be DIN-rail mounted alongside Ethernet I/O or other industrial equipment. To increase reliability, this switch provides dual redundant power inputs. Two power LED’s are also provided on this unit indicating a valid power source on both the redundant power inputs and also indicating when a power fault bus occurs.